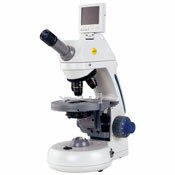 This newest addition to the popular Swift Digital Microscope line integrates a 3" LCD screen for easy collaborative viewing of specimens with a 5 Megapixel digital camera (captured) to view still digital images or real-time video files directly onto an SD card without using a computer. You can also connect directly to a computer with USB or integrate with existing technology via the RCA connection. 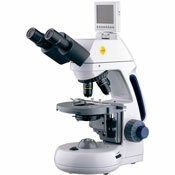 This professional grade microscope comes in Monocular or binocular versions with: Semi-Plan, Plan, and Phase Contrast Objective options.